Tickets On Sale From Now!! journey towards an enriching life. of life and hope for the future. kids’philharmonic@sg is a Singapore non-profit organisation whose mission is to mentor and provide an orchestral platform for young musicians from all walks of life, and to showcase their talents in the heartlands and concert halls across Singapore. They put up 2 major performances annually - 1 at the Esplanade and 1 at the Victoria Concert Hall to sold-out crowds. They also participate in community arts and charity activities both locally and abroad. The orchestra is sustained through funding from the Singapore Government, membership fees and donations. In May 2017, a group of Red Hatters in Singapore with common interests in volunteering activities came together in “open source” fashion to share our interests and volunteer experiences. The outcome of the meeting was a decision to spearhead a Singapore Corporate Social Responsibility (CSR) initiative. Making a positive difference to the community and our environment. Raise awareness amongst fellow Red Hatters to different social causes and special needs. Encourage Red Hatters to play a more active role to improve the conditions of communities in need and the environment. About the Concert Theme - "Heroes"
Some define “hero” as ordinary people who made themselves extraordinary. We believe there is a hero in everyone and we hope that the uplifting concert repertoire will inspire us to become heroes in our own movies. The first half of the concert will feature six musically talented Club Rainbow performers who will be dedicating their respective performances to their real life “heroes” who have journeyed with them over the years and given them their love and support. These Club Rainbow performers overcame many challenges to learn music and some even play more than one instrument. Whilst they may not fit your stereotype of a hero, their courage, outstanding achievements and noble qualities make them “heroes” in their own right. 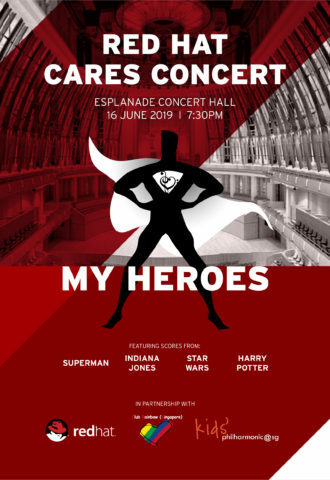 The second half of the concert will feature John Williams’ renowned compositions featuring screen heroes from “Superman”, “Indiana Jones”, “Star Wars” and “Harry Potter” performed by the Kids’ Philharmonic @ SG. 1. What are the objectives of the concert? The concert is aimed at: 1) providing a platform for Club Rainbow beneficiaries to showcase their music talent; 2) fundraise for Club Rainbow (we are targeting a minimum of SGD 50K after subtracting costs) & 3) supporting the local young musicians. 2. How long will the concert be? The concert will be about 2 hours in total with a 20-min interval. 3. Are the tickets transferable? Yes, tickets are transferable. You can purchase the tickets and gift to others. 4. Do I have to purchase a ticket for my child? Yes. Please note that Esplanade has a minimum age requirement of 6 years and above at our performance venues. Infants or children without tickets will not be admitted. 5. 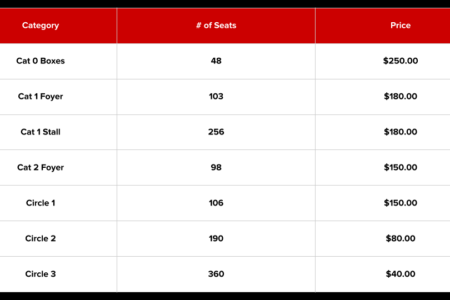 Will there be tax relief for my ticket purchase? No, the tickets purchased for this event are not eligible for tax relief because the event is ogranised under a “Private Event License”. 6. Can I help promote the event via social media websites? We welcome your help to promote the event via your PERSONAL social media i.e. set to Private contacts as this event is organised under a “Private Fundraising License” and not a “House to House Fundraising License”. 7. Can I take photos or record during a performance? No, this is not allowed during a performance. Audio and video recording equipment is not allowed into the performance venue.